Using old NASA imagery to look at Antarctic Ice in the 1960’s | Watts Up With That? WOODLANDS, Texas — Think of it as a space age twist to that adage: Something old, something new…something borrowed, something blue. Back in 1966 and 1967, NASA hurled a series of Lunar Orbiter spacecraft to the moon. Each of the five orbiters were dispatched to map the landscape in high-resolution and assist in charting where best to set down Apollo moonwalkers and open up the lunar surface to expanded human operations. Imagery gleaned from the Lunar Orbiters over 40 years ago is now getting a 21st century makeover thanks to the Lunar Orbiter Image Recovery Project (LOIRP). By gathering the vintage hardware to playback the imagery, and then upgrading it to digital standards, researchers have yielded a strikingly fresh look at the old moon. Furthermore, LOIRP’s efforts may also lead to retrieving and beefing up video from the first human landing on the moon by Apollo 11 astronauts in July 1969. Dennis Wingo, LOIRP’s team leader, detailed the group’s work in progress during last week’s 40th Lunar and Planetary Science Conference. Teamed with SpaceRef.com, LOIRP’s saga is one of acquiring the last surviving Ampex FR-900 machinery that can play analog image data from the Lunar Orbiter spacecraft. Wingo noted that the work is backed by NASA’s Exploration Systems Mission Directorate, the space agency’s Innovative Partnership Program, along with private organizations, making it possible to overhaul old equipment, digitally upgrade and clean-up the imagery via software. LOIRP is located at NASA’s Ames Research Center at Moffett Field, Calif. There, project members are taking the analog data, converting it into digital form and reconstructing the images. By moving them into the digital domain, Wingo said, the photos now offer a higher dynamic range and resolution than the original pictures, he added. “We’re going to be releasing these to the whole world,” Wingo said. Use of the refreshed images, contrasted to what NASA’s upcoming Lunar Reconnaissance Orbiter (LRO) mission is slated to produce, has an immediate scientific benefit. That is, what is the frequency of impacts on the Moon’s already substantially crater-pocked surface? There’s also a more down to Earth output thanks to LOIRP scientists. They have used a Lunar Orbiter 1 image of the Earth for climate studies, basically a snapshot frozen in time that shows the edge of the Antarctic ice pack on August 23, 1966. The team is working with the National Snow and Ice Data Center in Boulder, Colorado to correlate their images of the Earth with old NASA Nimbus 1 and Nimbus 2 spacecraft imagery that flew at about the same time — in the mid-1960s — as the Lunar Orbiter 1. Nimbus satellites were meteorological research and development spacecraft. Wingo said that the original Nimbus images may have been recorded on an Ampex FR-900 – so by processing the original Nimbus tapes there is a very good chance that they can provide NASA with polar ice pack data from ten years earlier. One treasure hunt outing by LOIRP may lead to finding what some term as “lost” Apollo 11 slow scan tapes, Wingo said. “We don’t think they are lost. People have been looking for the wrong tapes,” he said, explaining that they were recorded on Ampex FR-900 equipment — not on another type of recorder as previously thought. Wingo said those Apollo tapes are stored at the Federal Records Center, labeled and ready for a look see. “We think for the 40th anniversary of Apollo we may be able to get the original slow scan tapes,” Wingo said. If so, the hope is to recover them and give the public a higher-quality, never-before-seen view of human exploration of the Moon. There is a lesson learned output from LOIRP. In the beginning, very few people thought this could be done…but now they have seen the results,” Wingo said. It is not enough to have 100 year recording medium, Wingo explains. Without the retention of the specific era equipment that images are archived on, it will be impossible for future generations to recover older NASA or other satellite data, he advised. This is a general issue, not specific to the Lunar Orbiter program. The retention of critical hardware should be a requirement for flight efforts. The original historic Apollo 11 slow scan images have been lost due to inattention to this critical detail, Wingo concluded. UPDATE: Dennis Wingo responded in comments, and offers this LA Times story on the real trials and tribulations of this project. March 31, 2009 in Sea ice, Space, Uncategorized. This is why I am a fan of archiving critical data in a mechanical fashion. Even a standard vinyl LP can be played back using a dixie cup and a straight pin … though not may times and not with great fidelity. I believe our era will be looked at a thousand years from now as a dark age from which little information survives. Electronic archival is subject to loss and degradation. Writable CD-ROMs are only good for about 5 years. People’s pictures, documents, histories, publications will begin to disappear as computerized archives are lost or literally fade away. Nothing is written down anymore. The paper is cheap and decomposes rapidly. Google is attempting, for example, to digitize a large number of books, but what happens in case of a catastrophic loss of their archive? Soon all the data from the early space program will be lost as it fades away, media wears out, noise builds up from copies of copies, etc. Sad. 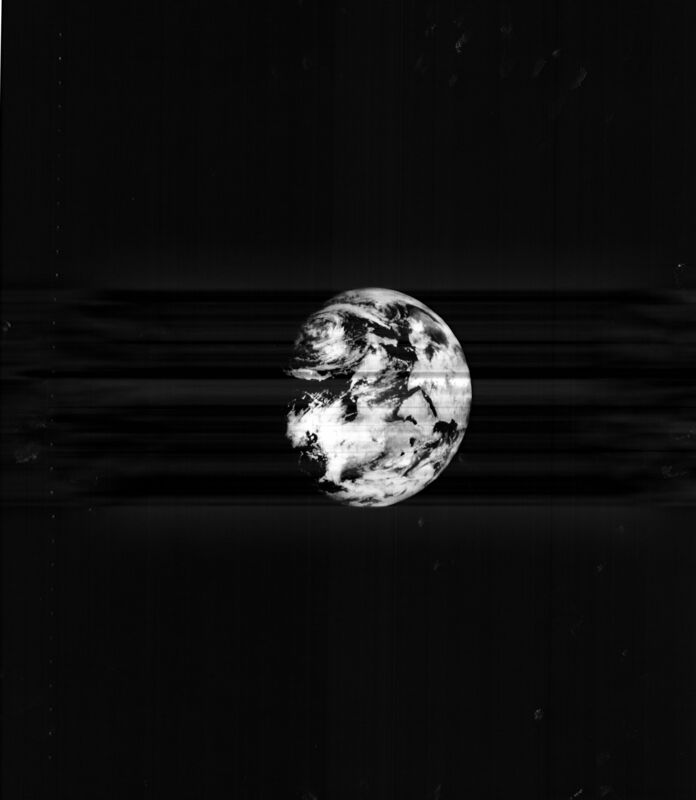 I worry about who is doing the “digital enhancement” of 1966 earth images. What if they have a slant towards alarmism and go wild with the white pen? Who can I really believe these days? Polar orbiting spy satellites have been operating since satellites first blasted off. Their missions are secret, of course,but what a great resource they would be if their early polar images could be released. Wow, been reading WUWT for a while now and was shocked to see an article about my project here! If someone here can provide a means to do it, I can post an additional image whereby we think that we can see the Antarctic ice pack on this date. Note to readers is that the image that you see above, (with the overlay recently added) was taken in LUNAR ORBIT! We have figured that we are getting about 1-10 km resolution on the Earth from that distance. We really hope that we can find the original Nimbus 2″ analog tapes. We have been in contact with some of the original operators of that equipment and have confirmed that much of the original Nimbus data was recorded on our same type of equipment. If anyone has ever seen anything that I have written about this subject, I am anything but an alarmist. Scientific integrity and letting the data go where it may is what I am after and if we do this, and do it honestly, it will be good for us all. and do you own study. Warning, this is a 1.12 gigabyte file. But I wonder what it was about these machines that made the tape only playable on that model. 2-inch video tape was pretty much an industry standard from the late 1950’s to the early 1970’s. If it used a standard recording format, it should have been playable on a variety of different machines, not just the FR900. REPLY: Having worked on a number of Ampex tape decks in my career, including 2″ and 1″ reel to reel formats, I can tell you that the FR900 was an oddball. While it used the “quad” motorized head familiar to the TV broadcasters, like this monster VR2000 http://www.lionlamb.us/quad/vr2000_2.jpg it was much more compact and designed for a variety of science and technology recording tasks, such as recording radar images from PPI scopes. In the case of the moon landing videos, a lot of it was done in SSTV (slow scan TV) which allowed for fitting the video signal into a narrower bandwidth radio transmission. SSTV and NTSC are not compatible as you may know. This was all part of the power consideration for transmitting data back to earth on limited battery/solar power. It is amazing that we were able to send men to the moon and back with the technology of the 1960’s. My dad worked in Mountainview back then making electronics for the space program. I am glad to see that the spirit of adventure and the excitement of discovery still lives there today. My career on multi-track tape transports were not for video use, they were for instrumentation, audio and some RF. Things like the IF of a receiver being directly recorded to high speed tape (1-inch at 240 ips) for playback and demodulation later. And I have seen some specialty machines that record things in formats that aren’t “industry standard”. This is particularly true with telemetry recorders that record slow moving DC signals where you record something else … say a tone … and frequency modulate that signal with the desired DC signal that would otherwise change too slowly to be recorded directly. But your explanation that this was a specialty device is reasonable as I have seen such beasts in my time, albeit for other purposes. It seems that there were more such specialty devices during that period of time, too, when data recording standards were few. Can you keep Anthony up to date on your work? From the horse’s mouth so to speak. sorry moderators, but one more . Anthony, any way that these shots of the Earth from the 60’s could be used to compare cloud cover and/or intensity? you see where i am going? use it as another post? Right you are. Also, we did not find them in working order. Here is an article from the LA Times from Sunday before last on how we came to have the drives. There is a lot of backstory to this effort. REPLY: Hi Dennis, thanks for checking in. Yours is an extraordinary effort, it deserves recognition. Just replacing the capacitors (and finding replacements) is a chore. For those who don’t know, in older equipment, before the days of solid tantalum capacitors, the ones of that era would dry out and the dielectric would fail. That’s about 90% of what is wrong with non-functioning older electronics. You are doing fascinating work. Please keep it posted here. Here is another image of the Earth as seen from lunar orbit that we hope to capture soon. This one is from Lunar Orbiter V and was taken in early August of 1967 almost a year after the Image shown above here. We hope to release that image in the next couple of weeks. Dennis: Thanks for the LA Times link. Great backstory. I often wonder what my dad did when he was working for Ampex and other NASA contractors back then. I’ll send his the story, he’ll get a kick out it. sort of an add-on to this… keep in mind that we launched men in to space and landed them on the moon with less computing power than most of us have on our desktops today. One of my off-and-on-again projects is to copy my 5 inch floppies from the late 70’s and early 80’s on to more stable media. I would encourage anyone who has old media and old data… wordstar or old Dbase 11 and Dbase III files, for example, to get them copied to more stable media. The data you have may be priceless. I’ll call this ROOD (Recovery of Orphaned Data) and say I think this is a great project. Being old enough to remember paper tape and punch cards, I have several things packed away. One day I may seal them in a non-destructible plastic container and bury it under a concrete pad. Someone can dig it up in the far future and wonder! Thanks, Dennis and LOIRP crew! John, I remember paper tape and punch cards and teletypes too. I may even have a few in a pine trunk in my mother’s attic. Rather than burying them in a time vault, let’s get the data transfered while there may still be devices to do it. And old timers like us who may still be able to remember and write up just what the hell it was we were thinking when we entered the data…. Thing is, you don’t need a “device” to read punch cards and paper tape. You can transcribe them to punched metal tape/plates if you wish or plastic or whatever. It can be “read” with a human eyeball and transcribed manually if needed. That is the beauty of mechanical/physical data storage. I can make a record of a sound recording on a gold disk if I have the resources. It won’t corrode and it can be played back at any time. Something punched can be stored in metal, rock, plastic, anything. You can enter the contents of a punched tape with a chisel onto a face of a cliff if you wish. Use pebbles to note the location of holes in a pattern buried in the earth. Punched tape and cards are probable the easiest to preserve. Magnetic media in one-off formats is the hardest. In the past year or so there has been a anniversary of the Parks Radio Telescope N.S.W , Australia and there were a number of radio interviews on ABC Radio with techo’s who had worked there. The techo’s who were on shift when the first pix from Apollo 11 were transmitted from the moon to Parks RT made comment how clear the image was when initially received. Apparently when retransmitted to Huston the bandwidth was quite a deal less so the image that the public saw was degraded. Hopefully this tape that Dennis has found was recorded from the direct output of Parks Radio Telescope. Around Canberra you can always come up against old racks of equipment that was originally in the Tidbinbilla and Orrial Radio telescopes, They are like the gate guard aircraft you see at military installations but at various Govt departments and contractor offices. I just happen to be involved in another historical restoration project to archive the CP/M computing story of Vector Graphic Inc. one of the pioneering microcomputer companies that I worked for in the early 80’s. I was a senior engineering tech there (we built all the prototypes and made em work). I have one of the last surviving complete sets of documentation from the company (including the training manuals that I would KILL for, for the FR-900’s). There are some guys who have virtualized the CP/M operating system, along with programs and other cool stuff to allow you to run your CP/M apps on a PC. Pretty cool project and we are looking to hand that off to the computer history museum at some point in the future (Mountain View Museum). Yep, at 15,000 RPM no less. The stability of the original FR=900’s was +/- 12.5 nanoseconds for the servo system. We have a company in northern Cal (Athan Corp) that replaced the capstan motor bearings (class 9), by dunking the motors in liquid nitrogen. We also had to get new custom servo belts made, capstan pinch rollers made, and various and sundry other interesting tidbits. Just as hard as getting the machine running was the problem of the demodulator. The demod does not exist anymore, not even a schematic. 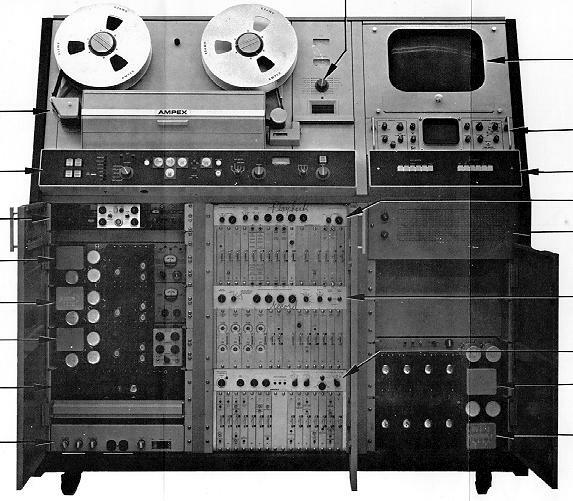 We found a document with the original mathematical equations and another old Ampex/Merlin engineering guy (Al Sturm) built a new demod from scratch in less than three months. Note: most of our tapes are recorded in pre-detection mode, meaning that the analog data was written to the tapes before demodulation! Forty three years later we have yet to find a tape that we cannot get data off of. That was the old NASA for ya. I can make a record of a sound recording on a gold disk if I have the resources. It won’t corrode and it can be played back at any time. Something punched can be stored in metal, rock, plastic, anything. You can enter the contents of a punched tape with a chisel onto a face of a cliff if you wish. Clay tablets used to be popular with the middle eastern cultures several thousand years ago, if you made an error, a wet finger erased the blooper. Then you could fire them to make them ‘read only’. The first generation reconnaissance satellite imagery (Corona) have been declassified and is available. It could probably be used to compile a partial record of arctic sea ice off Siberia for much of the sixties and early seventies. However nobody would have userd limited film to photograph Antarctica or Arctic Canada. OT Don’t be surprised to see the March UAH and RSS figure to be up. The lower troposphere temps during the month have been higher than last year by a margin. Can’t see Archibald being correct about the low he expects in May. I remember being able to read five unit code punched paper tape by eyeball. It’s ironic that it is probably easier to find someone who can read a 5,000 year old cuneiform clay tablet than it is to read 40 year old computer media. The only information that has survived for thousand of years intact was written on stone or plinths. These also have a date by. We do have the pentateuch and the Iliad, no? It is not the originals, it is the painful copying by generations of monks up to the discovery of the printing press. I have a copy of the first half of the Iliad printed in Venice in 1803: yellowing pages, still useful. The lesson is this: faithful copies. Technology can come up with more permanent records, but still, copying there should be. We call it back ups nowadays. This is fascinating and wonderful stuff. It addresses a problem we’ve been worrying about with our domestic photo collection. I recently told my wife to go ahead and spend a four-figure sum to get our digital photos printed in hardcopy. I don’t think it is the least bit hysterical or fanciful to suggest we are sleep-walking into a new Dark Age. PS: It took me a minute to realize that http://www.lpi.usra.edu/resources/lunarorbiter/images/preview/5027_h2.jpg has south at the top of the image and there is nothing of Antarctica visible in it. I also look forward to hearing more about your results. It’s good to see we have tinkerers and tech-buffs like yourself. People like you really do often come up with the most fascinating things, and usually do so on a shoestring. Keep it up! I checked the ABOUT page, and I must say that I don’t see why it is necessary for jeez to remain anonymous. Everyone else on the Moderation Team and Contributors uses his/her real name, and should do so in their official function on this website. Who is the real person behing “jeez”? I don’t like this cloaking. … We have a company in northern Cal (Athan Corp) that replaced the capstan motor bearings (class 9), by dunking the motors in liquid nitrogen. We also had to get new custom servo belts made, capstan pinch rollers made, and various and sundry other interesting tidbits. I figured that you’d have some mechanical challenges too. Is this all funded by NASA? Certainly an effort well spent. I’m somewhat familiar with the efforts to get computers from that era running again, I imagine that seeing some of the first recovered images was an exciting day. How has the tape media held up? Are you looking at as having one shot to get the best data and hope there will be enough oxide left for a second chance? I imagine that the read head “flies” over the tape – at 15,000 RPM it would be tough to make contact! What will be the new archival storage medium for this data? BTW – a note on clay tablets. I used to work for a printer company that pioneered letter quality dot matrix printing. To get the best record of pin impacts we used clay coated paper. Great stuff, if there were a texture on the face of the pin, we’d probably be able to see it. (The record was left by ink, not by depressions in the paper!) Magazines like National Geographic use paper with a high clay content to get their high quality images. Concerning the Gigabyte plus file size, why not set uo a torrent and and do the down load in goog old fashioned P2P style. Mu Torrent would be a good way to do it. Lots of big movie files are downloaded with no problem and they are bigger than this data set. Charles the Moderator, “The Dish” is a great movie. Thanks to Dennis Wingo for these efforts. I have saved your site in my Favorites. Now WUWT has many more projects to bring to the light of climate science. In reference to preserving current electronic records — including family portraits — what is a safe, long-lasting medium? I remember that my institute’s librarian was very worried about many of these issues. Plummeting temperatures today took the thermometer off the bottom of the scale, which means the team are currently enduring temperatures lower than -45°C. These extreme temperatures, the coldest experienced by the team so far in this expedition, have the strange physical side effect of causing the team to sound almost drunk as they slur their words and cognitive reactions are noticeably slower. The “physical side effect” is “strange” only, perhaps, if one has never heard of hypothermia. I’m copying and pasting the list of sponsors’ e-mails in case anyone wants to prevail upon them to show some human decency and remove the team members while there is yet time. An excellent and fascinating project. Thanks for sharing with us and the world. Sunlight begins reaching the ice in Late March. Enough heat to begin warming it enough to begin melting around the edges. Look at all that light blue over Siberia on the left. For precise measurement, photographs must be analyzed by computer — accounting for the non-linear nature of the media’s responses. Only original media can be used — i.e. only original negatives or original sensor raw data, not prints or copies which add their non-linear responses on top of the original non-linear responses. This applies to any old photograph of any feature at close to the film’s (or sensor’s) natural resolution. One of my projects involved taking very precise dimensional measurements from “photographic data” (i.e. negatives) — near the limit of photographic resolution. People thought they got truer results by using standard “image enhancements”. But, I proved that “enhancement” actually makes some features larger and some smaller. Moreover, photographic films have a logarithmic response to light. That further moves the “visually perceived edge” of a feature from its true position in space. To use old photos of the entire earth to get data about ice areas, one would have to become very sophisticated and electronic in determining the ice extent. Otherwise, the answer may be larger or smaller than the “true answer”. Back in my Army days I used those monstrous Ampex and 3M model 2 inch tape instrumentation recorders for a number of years to support projects that I worked. However, we had the opposite problem to Mr. Wingo. Instead of wanting to capture fleeting data we wanted to capture the maximum length of data so we ran them at 15/16 ips so those tapes would record for up to 72 hours. We used 32 track FM IF recording modules and put on one track of time code and one track of reference signal so that we could slave the playback to the original recording. Lugging around boxes of those big tapes served as my physical training every day. Good luck with your data recovery program. It is a noble task that really needs to be done. JohnB: This team on the ice is far north and going toward the Pole, so is in the coldest area. It’s warmer at the edges of the ice; I saw last week that much of Alaska had temps above freezing. … I have several things packed away. One day I may seal them in a non-destructible plastic container and bury it under a concrete pad. Someone can dig it up in the far future and wonder! And in the far future someone will wonder why there is a blob of oil-fed bacteria inside a deposit of tar under a layer of rocky sand. Nimbus 1 was my introduction to spacecraft operations. I was there for all 28 days of flight operations. Nimbus 2 was my introduction to spacecraft I&T and a continuing educaton in spacecraft ops. As part of that education I did the preliminary analysis on the video data that’s being resurrected here. This was the era that we first found the “brown cloud” over Asia. That’s the same “brown cloud,” of course, that was recently “discovered” again, much to my amusement. For Dennis – thanks for dredging up the memories. By the way, to add to my above post, the optical diffraction in the lens system must also be accounted for in the analysis. This is a function of the specific physical lens system used. If ice extents of a few percent one way or the other matter and the edges of the ice extent of interest are “photographically fuzzy”, one needs a lot of data relevant to the exact equipment used to take the photos plus the raw, uncorrected data (sensor or negative). Then one needs to write some computer code that makes all the needed corrections, takes the measurements, and provides the answers. Visual (eyeball) measurements will not do it. I have one of the last surviving complete sets of documentation from the company (including the training manuals that I would KILL for, for the FR-900’s). But In thought I would share with you the underhand efforts of the UK government to cover up the costs benefits of its Climate Change Act. it has just slipped out some massively increased costs but conveniently found some spectacular ‘benefits’. From somewhere. Sunlight gets stronger. After the equinox, the Northern Hemisphere has more daylight than darkness which means more time absorbing energy from the Sun and less time radiating it into space. The ocean starts to warm and the warmer water begins to melt the ice. Older cold war tapes should presumably exist and be declassified. My guess is that there is a “cold mine” (aka gold mine) out there of data from polar orbiting military satellites during the cold war. Similarly the Navy’s program of submarines measuring the thickness of the ice caps. M. Van Woert et al., 2002, IGARSS Proceedings, Toronto, Canada, June 24-28, 2002. National Snow and Ice Data Center. 1998, updated 2006. Submarine upward looking sonar ice draft profile data and statistics. Boulder, CO: National Snow and Ice Data Center/World Data Center for Glaciology. Digital media. See: Is sea ice disappearing? That seems to have been a somewhat common practice in those days. I worked on recorders that did basically the same thing. A receiver would amplify and filter the RF signal and the entire output of the IF stage would get recorded to tape. The signal would then get demodulated on playback. Tape and head wear was a problem for us back then. Perhaps better than original prints, but you really can’t improve on the basic raw data. That’s all there is. It would be like measuring 0.1 degree C changes in temperature from sensors that have no better than 1 degree resolution. As for archiving, CD’s will last a very long time, they darken with use, the laser modifies the polymers in the plastic. You see an increase in errors after a few thousand reads. Absent reading (and much of this info is from early readers) they will endure. Newer CD-Rom drives use less power, may not have this issue. DVD’s and Blu-Ray may degrade faster as they have much smaller feature size. Still have a DEC PC8-I paper tape reader/punch (8 channel) from the late 60’s. My KSR-29 Teletype became history a few years back. Folks at “T” didn’t believe they ever made a 29. IBM 705 code, military contract, looked a whole lot like the model 35. Some of that old stuff was so well made it may last forever. Hope the museum likes it. All I can say is, what a cool project! I followed the Apollo project religiously as a kid. Good luck and I look forward to the results! I have spent many hours at the Stanford Ampex archive! Oops, I tried to paste some quotes from the article but it failed. Mods, any help? “Although the UN’s Intergovernmental Panel on Climate Change (IPCC) only predicts a sea level rise of 59cm (17 inches) by 2100, Al Gore in his Oscar-winning film An Inconvenient Truth went much further, talking of 20 feet, and showing computer graphics of cities such as Shanghai and San Francisco half under water. We all know the graphic showing central London in similar plight. As for tiny island nations such as the Maldives and Tuvalu, as Prince Charles likes to tell us and the Archbishop of Canterbury was again parroting last week, they are due to vanish. Yea this is a slight misnomer. What is being referred to here are the original film images that were made in parallel with the tapes. The tapes have a much narrower range of grey scales than the original analog data. This was due to the method use to record the data on 35 mm film. Massive stone monuments are the way to go. Carve relief images and text into the walls. You could even archive the assembly code and binary that way. Imagine a huge stone temple or pyramid covered inside and out with thousands and thousands of zeros and ones! My dad took care of the helicopters that flew the Apollo CM and LM modules to the Cape. On my first engineering job, I met many of the men who put up the first spy satellites in the 60s. The PM on some of those projects is still alive, lives on Ramona, and did much of the technical work before he became PM. He is one hell of an engineer. These men can be found and debriefed. Many still have some old hardware laying around. Many would love to help out doing tech grunt work. Just curious, does the bolded/italic phrase mean that the tapes were never viewed when originally made, or that they were just never released to the general public? Can you get other information such as % cloud cover, vegetation cover, etc to compare with newer studies using satellite sensors? I really wish there was a way to submit sites of interest to WUWT. The comment about paper deteriorating reminded me of an article about data degradation I read some years ago. I believe it stated legal firms interested in long term preservation of documents were using archival quality paper. I could not find the article, but the “acid-free paper” article in Wikipedia states: “Alkaline paper has a life expectancy of over 1,000 years for the best paper and 500 years for average grades.” Of course that would require temperature controlled storage. Dry mined-out salt mines with controlled cool temperature and humidity would be likely candidates, I presume. I completely agree with all this global warming BS. Anna V, when I used your links, I saw the oceans get colder from Jan to Mar, not warmer. Zeroes and Ones are definitely weird constructs… imagine some future archaeologist spending an entire career trying to run the code off the obelisk, only to fail because he assumed the single line represented a nul while the large circles represented a bit. Then again, I guess you could consider that “hardware encryption”. Meanwhile, I’ve always been more than fascinated with the 60’s space program, and all of these images are beyond interesting to me. It reminds me how far we have come when even a cheap off-the-shelf computer has more processing power and greater ability to capture sound and images than even the multi-million dollar top quality analog equipment of just a few years ago. Concerning hyprothermia, you are so right. Would it be a just world if such stupidity went unpunished? If someone is dumb enough to cross a freeway blindfolded, should his genes be allowed to be passed on to the next generation? Hopefully our offsprings will have more intelligence. The drama is drawing my interest, I must admit. I have a reasonably large amount of precision resistors, capacitors, a few choke coils, etc. [in a wide range of values] from the approximate era of the Ampex equipment you are using. I have no further use for them and would be happy to make all available to your project free of charge if interested. If interested you could post a P.O. Box address. I just checked the Catlin Expedition progress and they’ve just passed 83N. Good grief, they’re barely past the first resupply point!! At this rate they’ll be lucky if they reach the north pole by Christmas. That kind of alkaline method for paper it is of recent invention, but the best papers ever made were not from direct cellulose from trees but from used cotton clothes (so with fibers included), these papers used potassium resinate (abietinate) and natural aluminum ammonium sulphate (the mineral known as “Tshernigite¨). Now it is commonly used not alum (the product of a reaction between a salt of metal having a valence of 3 with a salt of a metal having a valence of 1) but the simple aluminum sulphate. Looking at the vital stats, Hadows core body temperature looks to be awfully low. Houston, they have a problem! Less than 35°C is already moderate hypothermia. The guy is headed for big trouble. I doubt that sensor reading is accurate. I’ve noticed they fluctuate all over the place. About the Catlin expedition: Al the magnificent, the one to blame as the originator of this drama, should go there with all his parafernalia, and rescue them, or send his disciple to do it. And so they should. It is end of March /April (equinox) when it stops growing. Have a look at the plot on the right of this blog that shows the last ten years of ice growth and retreat. Regarding the Catlin Expedition: As soon as summer arrives and all the ice melts they plan on boarding a cruise ship and just sailing over the top and back home. Just kidding. This ice extent using old classified military data might be very helpful in pushing the data back 10 years or more. I wonder if we have any U2 overflight data as well? That might push it back even more. Allen63 — By the way, to add to my above post, the optical diffraction in the lens system must also be accounted for in the analysis. This is a function of the specific physical lens system used. I used to make realtime optical based meas equipment to the early 90’s used in semiconductor mfg. We found that optical linearity was also a factor, as well as specific magnification (just because a lens is marked at 100x doesn’t mean every one is exactly 100x.) We would also have a linearity correction that corrected for the slight bow effect you get from a flat sensor. A feature would seem slightly larger on the left side of the image field than the center, and so on. As you say it’s not as simple as getting hold of a picture and counting pixels and such. On the other hand you probably could adjust a bit for linearity by measuring between known map points if there were enough on the image, so you wouldn’t necessarily have to have the original lensing data. A 50-year low in solar wind pressure: Measurements by the Ulysses spacecraft reveal a 20 percent drop in solar wind pressure since the mid-1990s — the lowest point since such measurements began in the 1960s. The solar wind helps keep galactic cosmic rays out of the inner solar system. With the solar wind flagging, more cosmic rays are permitted to enter, resulting in increased health hazards for astronauts. Weaker solar wind also means fewer geomagnetic storms and auroras on Earth. A 55-year low in solar radio emissions that might — or might not — indicate weakness in the sun’s global magnetic field. A 12-year low in solar irradiance: Several NASA spacecraft find the sun’s brightness has dropped by 0.02% percent at visible wavelengths and a whopping 6 percent at extreme UV wavelengths since the solar minimum of 1996. They really don’t get it, do they? Science is never settled, never. Even if the alarmists are right, it won’t be “settled.” Neither will it be if they are wrong. Period. Their silly joke assumes the skeptic side is working for their own consensus. They simply don’t understand that the point is not to find a consensus, but to show that consensus a) does not exist one way or another and b) it would not matter if it did. I would not expect much better from Schmidt or Mann, however. I do hope the new digital masters are uncompressed and in a very simple format. Digital memory is cheap and getting cheaper. Reproducing a 2009 codec in 2049 is likely to problematic. Also remember the BBC Doomsday project. Input from a million Brits on two laser disks was lost due to player issues. Then one of two disks was recreated, only to be lost again! So the best defense is many faithful copies in many different hands. Organisations and even states come an go. Charles aka jeez – permission granted to give Mr. Wingo my email address. The original analog tapes were viewed, at least a very small percentage of them. The filmsets were used to get into the general vicinity of where they wanted to land (the landing ellipses). Then they went to the biggest supercomputer that NASA Had (A Univac 1100 with 256k! of usable RAM), and created digitized “chits” which were 800 x 800 samples at 6 bit depth. These were used to look for boulders at the landing site. As far as we have been able to determine, these digitized images were never saved. I read one document where they estimated that to just digitize the Lunar Orbiter 1 images would take 30,000 1200 bpi tapes!! So they just did not think about it then and it is really on today that storage has gotten cheap enough and desktop computers powerful enough, to do this without costing $-8 figure numbers. Thanks for the response; it will be very interesting to see how much “un-mined gold” you can recover from the tapes. Hope to see future post here [or elsewhere] with your results. Wow Dennis! You and your team are my new heroes. head speeds that made body armor seem appropriate! Whatever you do, Mr Wingo, please don’t resuscitate 8-track players. Thank you. Slightly O.T. All those taking memorial shots of their infants and other personal events with digital cameras. Go and buy a film point and shoot and take some parallel shots with it. Keep the negatives carefully. They will still be usable in 50 years. As regards filmsets from the early missions. Film had and still has a far better dynamic resolution than digital. Digital enhancement evolves continuously and will better interrupt what is on the original analogue film. (…) It is amazing that we were able to send men to the moon and back with the technology of the 1960’s. Just thinking that my N95 could have formed the core of a 60’s satellite. I was reading this thread while eyeing up 250 MSPS A/D converters over at TI. At 7x7x1 (mm) do you think they will interfere with the compressed air lines? A high school friend of mine back in the late 50’s did a science fair project making mica paper. His dad was a chemist for 3M company, so I’m sure his dad supplied the idea and material. He would heat up mica and grind it into a pulp that would result in a white paper like substance. I don’t think 3M ever tried to produce it commercially but it would be a good media for a 1000 year document. Any of you crazy enough to actually want to download and work on that image using a home computer, here is how. It can do a lot but is not like Photoshop. Been described as a spreadsheet for images. Can do some very unusual things, if you can work out how to drive it. Cross platform, Unix, Mac, XP. Don’t know if Vista is ok and the Windows version is less stable. Very useful piece of software to know about. Be warned, you might be disappointed, is not a casual image. Reply: Gimp opens the image just fine although it does have to convert the image from 16 bits per channel to 8 bits per channel which, except for the most serious scientist should not be a problem. Open source and free, and it has a much more Photoshop like interface. It does take a minute or so to load the image on my desktop, a dual core XP machine with 3Gb RAM. ~ charles the moderator. I am very grateful for the work of Dennis Wingo and all the other heroes of the space age who have commented on this thread. Both my husband and I followed everything, from different vantage points at that time. What miracles American know-how and can-do spirit have brought about. My belief is that this determination and drive still exist; I can see it in the grandchildren. It will take a lot of dedicated effort to see that it is passed on through the generations. Anthony and WUWT is helping tremendously, today by introducing this thread, tangential yet essential. Hit the tip jar, folks. Just thinking that my N95 could have formed the core of a 60’s satellite. I was reading this thread while eyeing up 250 MSPS A/D converters over at TI. Anthony, just reading a financial report that I subscribe to and found that this http://en.wikipedia.org/wiki/Survivorship_bias applies to markets and if you scroll down, to reporting of GW as well. I know Wiki is wobbly but selection bias adds a new dimension to analysis be it financial or any other information gathering system. Speaking of sea ice… CT still has not fixed the Compare NH Sea Ice product… WUWT? I believe our era will be looked at a thousand years from now as a dark age from which little information survives. This is a problem across all types of data storage. The National Archives and NIST have been interested in this for some time. (by the way has anyone on this team contacted NIST to see if they have any equipment that they used in research that might assist in this project). About 10 years ago I worked in an IT company that had a 400,000 cartridge tape library and a few thousand reel to reel tapes for computer data. I was asked to figure out a safe retention time for tapes and how often they should be read into memory and re-recorded on new media to preserve data that had records preservation limits. I contacted the folks at NIST and the National Archives on this issue, along with some of the manufactures. The short answer is no one knows how long digital magnetic tape will last. The manufactures would only specify the usability of the tape in read write cycles and would not even venture a guess on vault storage life. In the case of the reel to reel tapes if they were wound with too much tension over time the tape would shrink and “cinch” forming buckles in the tape spool as the material slowly tried to adjust to the tension. The gold substrate archival CD’s are probably good for decades if stored carefully and only read when necessary. One of the most reliable storage devices I could find was actually the simple flash memory chip. It can hold the charges used for data storage for up to 100 years according to the info I found, and will tolerate abuse that would destroy other storage media. In one experiment they baked a flash drive into a custard pie and it worked just fine when removed and cleaned up! That said you have two storage issue both the media and the methods and equipment to recover the data, both software and hardware. How many of you can recover data from a wps document, even if you can read the floppy disk it is stored on? You also need to consider the data configuration, for example on images jpg, and gif are two of the best supported formats and will probably persist for many decades. Even if they are not the format is simple enough and well documented enough (right now) that one off code could be written to recover the image if necessary. More troublesome is things like interface connections between hardware devices. How many of you still have a floppy drive available to you? How many of you can plug in a serial interface to your computer? Right now you can still find adapters USB to serial but even the USB interface has morphed into multiple versions. If you work with critical data, please consider storing both the data on archival media and the means to recover it, both hardware and software. This is going to be a big problem for libraries in the near future and there are studies on the topic if you look for them. In the case of critical data, store it in several different media formats if possible to ensure it will be readable by some future system. For example store an important text document as .doc .rtf and .odt or pdf formats would greatly increase the odds of some future system being able to read at least one file. In the case of spread sheets the comma delimited file could be saved as a backup to the normal spreadsheet format you normally work in. In the case of images, jpg, gif, and tiff files are well supported file formats and not likely to disappear any time soon as they do their job very well and are widely supported in multiple software systems. In the interest of history about the AGW debate, I would encourage Anthony to look into an archival backup of this forum, and donation of a copy to a large library, as it will 50 years from now, be a priceless archive of the mood of the time and the minutia of the debate. The majority of the digital information we have available today will evaporate in useful terms in 15-30 years from now. Most of what you know will be unavailable to your children and grandchildren unless everyone makes an effort to preserve the essential data from the late 20th century and the early 21’st century. Do you have essential data records in your safety deposit box? Great post and I agree. A mantra that I keep saying is that it does not matter if you have a 100 year storage media if you do not have a 100 year means of reading that information from the storage media. I would add that for sites like Anthony’s or Steve M’s, these will become a valuable historical research asset at some time in the future and just how many decades will we be able to read wordpress threads? Just think about how many articles and comments that exist already here and this is just as valuable as any other information source. It would be possible to do what you are talking about but I would have to call the suicide prevention line shortly thereafter. There is one thing about 1960’s era equipment that most people don’t realize today. It was incredibly touchy and it required trained field engineers to maintain. My first career was as a Field Engineer (FE) in the late 1970’s. My company build a large impact line printer, card punches, and card readers, interfaced to IBM, Amdahl, and Burrough’s computers. For a medium sized location such as a bank data processing center, you probably had 15 guys that just baby sat the hard drives, tape drives, printers, card punches, card readers, keypunch machines, the CPU, and the comms system to interface to the big beasties. ALL of the guys that did this stuff had to have months worth of training (I spent three and a half months in school 8 hours per day to learn my hardware) where you lived with the equipment, were trained by the people that built the equipment or the training department where you were intensively fed every detail in the books, and THEN you had practical troubleshooting classes where you learned the quirks of your hardware, what had a tendency to fail, and how to fix them. Could you imagine in 50 years from now, when we all have passed from the scene, trying to get a mainframe installation like I described up and running again? Oh and by the way, there is the software to make it run in the manner that it was designed to do. I don’t think that people in general have a proper appreciation of just how complex that technology was and is and how far we have come in terms of usability and portability. Even with this, could you imagine trying to bring a laptop from today back to operational status in 50 years. Hell most people toss their systems in 5 years. I have a Mac Pismo laptop that is nine years old and I have gone through quite a lot of work to keep it operational. So, no while doing something like you suggest is possible, the costs would far outweigh any benefit of doing so. Considering how few parts you have, may I suggest considering having the heads coated by a very thin diamond layer. They might last 400 times longer. The hardest, strongest, and slickest is known as tetrahedral amorphous carbon, or ta-C. For example a coating of only 2 μm thickness of ta-C increases the resistance of common (ie. type 304) stainless steel against abrasive wear; changing its lifetime in such service from one week to 85 years. Diamond like coatings are also used in racing applications to keep high wear parts alive. Here is another vendor. Similar coatings are used on disk drive platters to reduce friction and wear.